Social work students author children's books on grief | Post-wildfires, deep psychic wounds linger | Acupuncture eligibility for substance abuse close in W.Va.
Students at the University of Southern Mississippi School of Social Work spent last semester writing and illustrating books for children on the subject of grief. The brainchild of clinical instructor Rachel Lahasky, the undergraduate project was honored with an invitation to present it at a national children's literature conference. The Camp Fire disaster in California that killed 85 people last fall left survivors with long-term emotional aftereffects that in many cases reached post-traumatic stress syndrome levels, experts note. Two essential remedies are mental health treatment and community support, says Sandro Galea, dean of the Boston University School of Public Health. Acupuncture eligibility for substance abuse close in W.Va.
West Virginia social workers are among the professionals that will be allowed -- with appropriate licensure -- to use acupuncture as an aid to substance abuse recovery as early as May. The practice, formally called auricular acudetox and applied to the ear, was legalized in the state in March. Children who were most likely to develop attention-deficit/hyperactivity disorder and depression had increased odds of being bullied, UK researchers reported in JAMA Psychiatry. The findings, based on data involving 5,028 youths in the Avon Longitudinal Study of Parents and Children born between 1991 and 1992, also showed a higher likelihood of bullying exposure among those with elevated body mass index, but not those who were more likely to develop autism, obsessive compulsive disorder, bipolar disorder or neuroticism. The Massachusetts National Association of Social Workers chapter is supporting two pieces of legislation, one that would restrict insurers' payment recovery practices and another that would pay down student loan costs for qualified social workers. State Rep. William "Smitty" Pignatelli, D-Lenox, said social workers do "the most important work in the commonwealth." Untreated stress dampens our immune systems, increasing the risk of disease and even shrinking our brains, writes Lynn Allison. Keep your immune systems strong with exercise, adequate sleep and frequent hugs, says author Fabrizio Mancini. 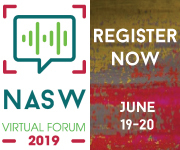 The recorded sessions from the 2018 NASW Virtual Forum, "Opioid Crisis: No Community Is Immune," are here in an on-demand format. Access cutting-edge presentations by recognized thought leaders to enhance your knowledge of practice trends, policy, and research findings. Choose from 8 breakout sessions, 4 plenary sessions, and earn up to 12 CE hours, including ethics credits. Social worker Donald McDonald has been in recovery for 14 years. Now he is helping other people in North Carolina, which is grappling with an opioid addiction crisis, recover from addiction. Learn more about his work. You never learn it all. ... I don't care if you're the greatest, there's always something to learn.